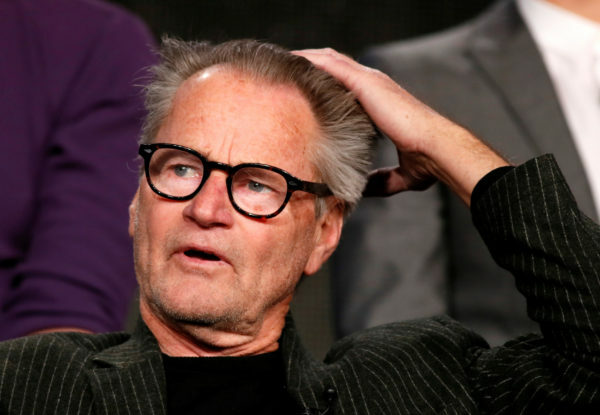 Actor Sam Shepard talks about Discovery Channel's "Klondike" during the Winter 2014 TCA presentations in Pasadena, California, Jan. 9, 2014. Chris Boneau, a spokesman for Shepard’s family, confirmed Shepard’s death to the Los Angeles Times in a statement. “The family requests privacy at this difficult time,” he said. Shepard made his earliest impression on the New York theater scene in 1966, when he took home Obie Awards for three plays: “Chicago,” “Red Cross” and “Icarus’ Mother.” The playwright would go on to win 10 more Obie Awards in his distinguished career. In 1969, Shepard married actress O-Lan Jones, with whom he had one son, Jesse Mojo Shepard, in 1970. The play centers on a family haunted by the past as it comes together in its aging Illinois farmhouse, reflecting shades of Shepard’s own childhood with his father, whom the playwright described as alcoholic. It earned Shepard the Pulitzer Prize in 1979. In 1982, Shepard starred in “Frances” alongside Jessica Lange, with whom he would have a decades-spanning relationship. He divorced Jones in 1984. Lange and Shepard had two children together, Hannah Jane, in 1985, and Samuel Walker Shepard, in 1987. “The most righteous right stuff is the private property of Air Force test pilot Chuck Yeager, played by Sam Shepard in a manner guaranteed to fill the gap created when Gary Cooper left us,” Times film critic Sheila Benson said of Shepard’s easy masculinity in her original review of the film. Shepard’s performance earned him an Academy Award nomination for best supporting actor. This vacillation between artistic interests and latent embodiment of the long-lost cowboy would come to define Shepard throughout his career. “I still think it all comes from the same place, but it’s great to be able to change it up,” Shepard told The Times in 2011. “It would be like riding the same horse all the time. “To sing a song is quite different than to write a poem. I’m not and never will be a novelist, but to write a novel is not the same thing as writing a play. There is a difference in form, but essentially what you’re after is the same thing,” Shepard concluded. It was that same interview with The Times, conducted by phone, that had to be delayed when Shepard, quite literally, had to see a man about a horse. “I was at a horse sale yesterday, and it was just all-consuming,” Shepard said. He went on to explain that he didn’t fly when traveling around the continental United States, preferring instead to explore the open road. Though that may sound idyllic, Shepard was not an artist who shied from the ugliness of the world. In his 2004 play “God of Hell,” Shepard tackled a post-9/11 country, besieged in equal parts by patriotism and fascism, sometimes disguised as the same thing. But all hope was not lost, according to Shepard. “The hopeful part is that at least they see things as they really are and don’t attempt to disguise it in other forms. And the more people see things as they are, the more hope there may be to bring about something different,” he said. Shepard was not without his own demons, however. In 2009, he was arrested for drunken driving in Illinois and was sentenced to 24 months probation, alcohol education classes and 100 hours of community service. In 2015, he was arrested for aggravated drunk driving in New Mexico, though charges were later dismissed, despite Shepard failing a field sobriety test. Shepard remained active throughout the twilight of his career, publishing the play “A Particle of Dread,” his take on Oedipus, in 2014, as well as appearing in Netflix’s “Bloodline” throughout the show’s three-season run. Survivors include his children, Jesse, Hannah and Walker Shepard, and his sisters Sandy and Roxanne Rogers. Funeral arrangements remain private. Plans for a public memorial have not been determined.